The seat belt is one of our best protections in a car crash. 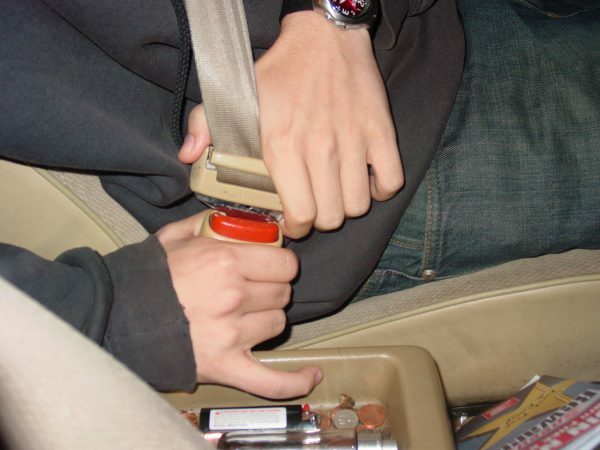 In fact, according to the Center’s for Disease Control and Prevention, “seat belt use is the most effective way to save lives and reduce injuries in crashes as more than half (range from 53% – 59%) of teens and aged 13 – 44 years who died in crashes in 2014 were unrestrained at the time of the crash.” In short, seat belts save lives, but how did then end up in our cars in the first place? Below is a brief history of the car seat belt. The seat belt was invented by George Cayley, an English engineer in the late 1800’s who created these belts to help keep pilots inside their gliders. However, the first patented seat belt was created by American Edward J. Claghorn on February 10, 1885 in order to keep tourists safe in taxis in New York City. Over time, the seat belt slowly starting showing up in manufacture cars to help passengers and drivers stay put inside their car seats. There was less concern for overall driving safety. Though invented in the late 1800’s, it wasn’t until the mid 1930’s when several U.S. physicians began testing lap belts and immediately saw their impact and began urging manufacturers to provide seat belts in all cars. In 1954, Sports Car Club of America required competing drivers to wear lap belts during competitions and in the following year, the Society of Automotive Engineers (SAE) appointed a Motor Vehicle Seat Belt Committee. Race car drivers were the first to really wear seat belts to help protect them against serious internal injuries. The real breakthrough with modern seat belts came in 1958 when Swedish engineer Nils Bohlin invented the three-point seatbelt. Up until this point, seat belts in cars were two-point lap belts, which strapped across the body, with the buckle placed over the abdomen. Volvo hired Bohlin in 1958 and he designed the seat belts we know today through a three point seat belt that better protects the driver and passenger in an accident. The three point design was created to help secure both the upper and lower body. Better yet, this seat belt design was simple and effective, leading other car manufacturers to borrow the design. When Bohlin passed away in 2002, Volvo had estimated that the seat belt had saved more than one million lives in the four decades since it was introduced. Once the idea of safety benefits of seat belts caught on in the U.S. public, sales of seat belts skyrocketed. Auto companies offered seat belts as optional equipment and were even sold at local gas stations. Since 1966, American vehicles are required to have seat belts in their cars. As such, by 1975, most first-world countries had a seat belt requirement in their cars. Once they became more common in cars, laws soon followed afterwards. By 1970, the world’s first seat belt law was created in Victoria, Australia, which required passengers to wear their seat belts at all times. In the U.S., seat belt laws came around the time of the creation of The National Traffic and Motor Vehicle Safety Act of 1966. Though they were required by law to be in cars, wearing seat belt laws were a different story. The National Ad Council ran countless ads for 25 plus years encouraging drivers to “Buckle Up.” States slowly starting implementing laws and by 1995, every state except New Hampshire had “Click it or ticket” laws. Currently, all states have a seat belt enforcing law. So, what’s next for the seat belt? Ford demonstrated its inflatable safety belt in 2001 where a shoulder belt containing an airbag would instantaneously inflate when a car is in a collision. Other car manufacturers are looking to make the seat belt more comfortable and convenient for drivers. From the criss-cross experimental safety belts to seat belts that are tailored to our individual bodies, there are many experimental seat belt types in the pipeline that could affect the way we drive.